Native app and hybrid app, the words are common in the field of mobile applications development. Obviously, the developers know what do they exactly mean but I am sure, still there are many who just know that native application is an expensive solution. So, let me first tell that native apps are basically built for a particular platform, for example, Windows, iOS, or Android. If a native app is built for an android platform, there is no way that you can use it for an iOS platform. Native apps are written for a specific platform and therefore they deliver better user experience and faster performance. 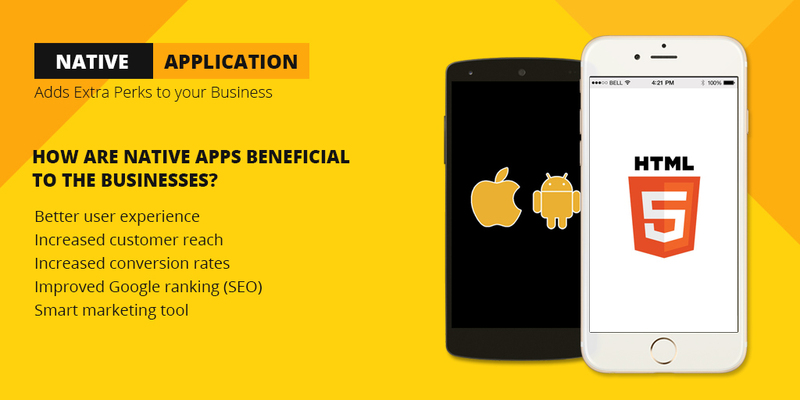 How are native apps beneficial to the businesses? Better user experience: Native apps are known to create a stickier relationship with users. The app design can experience with features, gestures, and behaviors which may lead to easy conversions. The native app allows to make more use of APIs designed specifically for the experience one is trying to accomplish and if done correctly, then the user will use your native app as a central part of the experience. Increased customer reach: In the times where maximum search over the internet happens on the phone, it becomes essential to expose your business on the touch of fingertips. With an app on mobile, you will be providing convenience value to your customers who now can easily see your product and place order. Further, the major highlight of native apps is these that they can be used in offline mode also. So, even when the customer does not have good access of internet, still your app can hold him. Increased conversion rates: We all know how crucial the conversion rates are for online businesses and with continually advancing technology along with raising consumer expectations, a native app is the only solution to obtain higher conversion rate. Improved Google ranking (SEO): Google often displays apps among its first few results when a search is conducted through a mobile phone. Being ranked in first few has become extremely important as mobile users do not get to venture deep into the results just like the desktop users. And a native app can be a powerful SEO weapon to leave behind your competitor. Smart marketing tool: Having a native app for your business is a smart move for two reasons. First, People really appreciate the easy information and an app always allow the user to find his relevant information in time. Second, Having an app on the mobile phone of users is a big reminder of your brand to them. Even if they are not frequent users of your app, still, the icon on the screen keeps reminding them of your brand. Thus, that’s how native app has the clear advantage of personalized engagement which is essential for ultimate customer experience and brand loyalty. The app also has the ability to use and leverage your smartphone’s capabilities like camera, GPS, etc. So, the native app is the right idea for your business, if you really want the virtual feel, look, and performance of the app to impress the users and depress the competitors.